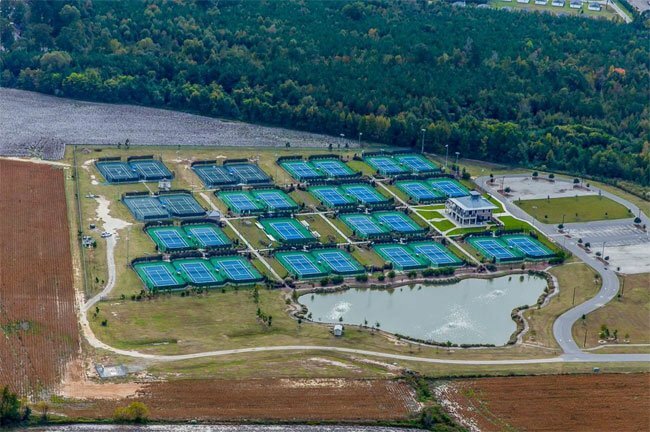 The complex includes 24 asphalt courts and six clay courts for both tennis enthusiasts and professionals. The center recently hosted the 2014 McLeod for Health Florence Open, won by 2014 International Tennis Federation Junior World Champion CiCi Bellis from San Francisco. The complex will again be hosting the United States Tennis Association’s Women’s Pro-Circuit competition during October of 2015. The tennis complex offers clinics and instruction to players of all levels as well as an after-school outreach program for local youth. A study area for students is provided within the 5,000-square-foot activity center. Florence is also home to the Freedom Florence Recreational Park. The tennis center is named for Dr. C. Edward Floyd, chairman of the Doctors Bruce and Lee Foundation.